(Photo: REUTERS / Kim Hong-J)A protester from a right-wing, conservative and anti-Japanese civic group steps on a banner depicting Japanese Prime Minister Shinzo Abe during an anti-Japan rally celebrating Independence Movement Day, in front of the Japanese embassy in Seoul March 1, 2014. This year commemorates the 95th year of the declaration of the nation's independence from Japanese colonization on March 1, 1919. The Anne Frank picture refers to the hundreds of vandalized copies of "The Diary of a Young Girl" and books related to Frank discovered in February in public libraries throughout Tokyo. AMSTERDAM (Reuters) - Japanese Prime Minister Shinzo Abe was to visit the Anne Frank House museum in Amsterdam on Sunday to highlight Japan's friendship with the Jewish people and sees no contradiction with his recent controversial visit to the Yasukuni Shrine at home. The Anne Frank House, where the German-born Jewish girl kept a diary of her life in hiding before she was discovered and died in a Nazi concentration camp, is now one of Europe's best-known memorials to the victims of the holocaust, drawing more than a million visitors per year. Abe's planned visit comes less than three months after his controversial Dec. 26 visit to Tokyo's Yasukuni Shrine, seen by Japan's Asian neighbours as a symbol of Japan's wartime aggression, as it honours convicted war criminals as well as others who died in battle. "On this visit (to the Anne Frank House), we would like to reiterate the lasting and profound friendship between Japan and the Jewish people around the world," a foreign ministry spokesman told Reuters. Asked whether there was a difference between visiting a memorial to Japanese soldiers at home and a memorial to war victims abroad, the spokesman said "there is no contradiction". He said Yasukuni enshrines 2.46 million souls who died for their country during conflicts since 1853, including both world wars, and that at the time of the visit, Abe issued a pledge that Japan must never wage a war again. "Acknowledging historical issues in an open manner and passing down the lessons of history to future generations is the first step to pursuing peace," he said. Yasukuni played a key role in the wartime state Shinto religion which mobilised the population to fight in the name of a divine emperor. China and South Korea, which both have been occupied by Japan, have repeatedly criticised visits by Japanese leaders to the shrine. Abe - in the Netherlands for a G7 summit - will be the most prominent world leader to visit the Anne Frank house since Israeli President Shimon Peres, former German President Christian Wulff and former U.N. Secretary-General Kofi Annan. 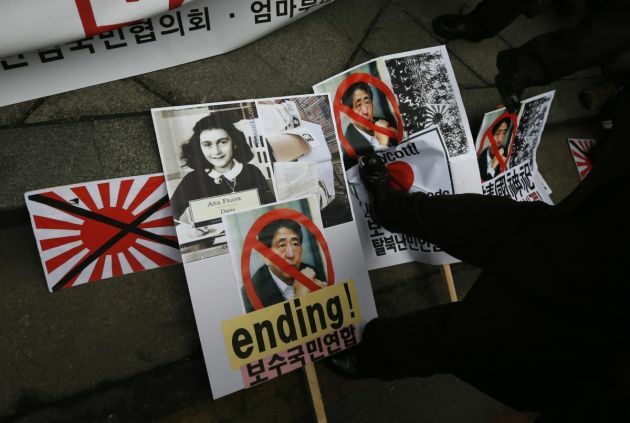 "Abe seems more sensitive to Western criticisms of his revisionism than those coming from China or Korea, and in particular of the Jewish American community as represented by the Simon Wiesenthal Center," Sophia University professor Koichi Nakano told Reuters in an email. He added that Abe's planned visit to the Anne Frank house appears to reflect his desire to send a message to reassure U.S. policymakers more than anyone else. An official at the Anne Frank House museum said the story of the young diarist is well known in Japan and more than 33,000 Japanese tourists visited the house last year. The Abe visit to the house comes after a series of incidents in recent months in Japan in which Anne Frank diaries were vandalized in public libraries. A suspect has been arrested. A government official told reporters last week that there is no direct causal relationship between these incidents and Abe's visit, but said Abe wants to convey the message that many Japanese people are pained by the vandalism. Abe is expected to have a trilateral meeting with U.S. President Barack Obama and South Korean President Park Geun-hye on the sidelines of Monday-Tuesday's nuclear security and G7 summits in The Hague. Analyst Tobias Harris at political risk consultancy Teneo Intelligence said the meeting will focus on North Korea and is not expected to address the history and territorial issues that have plagued the Japan-South Korea relationship in recent years. But he added that the ill will generated by Abe's visit to the Yasukuni Shrine remains an obstacle to closer cooperation.